Microsoft has announced, that Windows 10 Fall Update supports media streaming to DLNA and Miracast receivers from Microsoft Edge browser. Also media streaming via operating system is supported. Here’s a look, how these features are behaving. Media streaming in Windows wasn’t a “home run” within the past. DLNA and Miracast implementation in Windows and the receiver firmware wasn’t always a good combination. To much trouble for ordinary users. See this tweet or the article Using MSFT Uncertified Play To DLNA devices with W8 Modern UI Apps from MVP Barb Bowman. Well, Microsoft has lowered DLNA requirements in Windows 8.1 – and my hope was, that DLNA and Miracast support will be greatly improved in Windows 10 RTM. 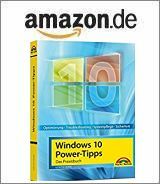 Barb’s article Windows 10 Home Entertainment (Should you Upgrade?) is reflecting what I’ve found out during intensive testing Windows 10 RTM (Build 10240). Instead of doing better DLNA and Miracast streaming, thing went even more worse. HDMI receivers that worked with Windows 8.1 refuse Miracast connection in Windows 10. But Windows 10 Fall Update shall improve that, because Microsoft has announced cast media features in Build 10576. Well Windows 10 Fall Update (Threshold 2, TH2) ist Build 10586 – and according to Barb Bowman’s blog post Get Miracast working on Surface Pro original with TH2 10586 Microsoft messed it up. The supplied driver for the Marvell Wireless chip for TH2 isn’t Miracast enabled. Barb plot a workaround how to install a Surface Pro 2 Wi-Fi driver that support Miracast. BTW: I received several reader feedback indicating that Miracast was broken on different Windows 8.1 machines, after upgrade to Windows 10 – although Miracast worked well under Windows 8.1. Just keep this in mind, because Microsoft aggressively trying to force users into a Windows 10 upgrade. Microsoft has announced new media casting in Microsoft Edge for Build 10576 (and subsequent builds). 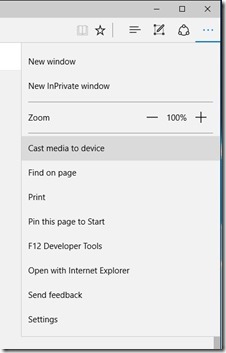 Media Casting in Microsoft Edge: You can now use Microsoft Edge to cast video, picture, and audio content from your browser to any Miracast and DLNA enabled device on your network. Cast a video from YouTube: Go to YouTube.com in Microsoft Edge. Click on the “…” menu and the top left, and select “Cast media to device” and select the Miracast or DLNA device you want to cast to. Cast a Facebook photo album: Login to Facebook in Microsoft Edge and click on the first photo in one of your photo albums to cast. Click on the “…” menu and the top left, and select “Cast media to device” and select the Miracast or DLNA device you want to cast to. Navigate through your photo album by clicking on the forward and backward buttons. 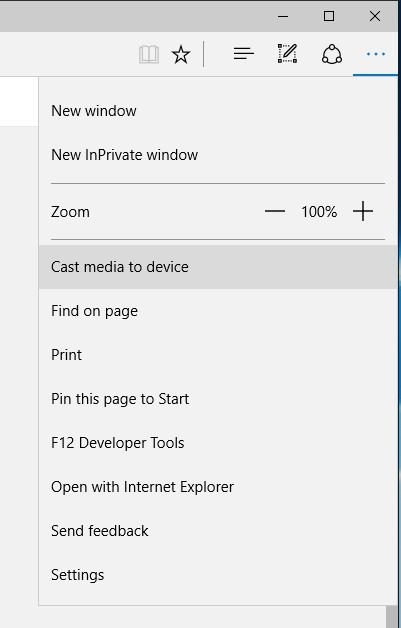 Cast your music from Pandora: Login to Pandora in Microsoft Edge to get to your music and click on the “…” menu and the top left, and select “Cast media to device” and select the Miracast or DLNA device you want to cast to. I’ve tested these features in Build 10576 and also in Build 10586 (Fall-Update) on a Medion Akoya P2214T. This machine was my test bed for many Miracast tests under Windows 8.1 and Windows 10 RTM. Most of the Miracast receivers I’ve tested, was able to connect. I’ve published the following articles within my German blog. In brief: Casting in Microsoft Edge was a mess in Build 10576 and Build 10586. The longer version: Streaming to a Miracast receiver works (not to well, but it works) on operating system level, using projection tile in notification center. Windows 10 found several Miracast receivers I used for my test and was able to connect and stream audio and video data to most of these receivers. My attempt, to use Cast media to device in Microsoft Edge browser was simply a mess. The Windows 10 machine tried to connect to my Miracast sink, but throw a blue screen of dead (VIDEO_SCHEDULER_INTERNAL_ERROR) after a few seconds. Analyzing the dump file showed a Watchdog Violation error in video driver dxgmms1.sys. Stop code 0x00000119 is documented here and has been observed in Windows 10 here. Of course, driver support is a responsibility of hardware vendors. But, if drivers are shipped during setup and are updated via Windows Update, they shall not throw BSODs. Also my attempts to stream to a DLNA receiver wasn’t too successful. Long story short resume from my tests: Media casting in Windows 10 Fall Update is simply a mess – nothing near like plug & play – what a common user is looking for. Not really exciting– or what’s your opinion? Do you have similar or different experiences? This entry was posted in Windows and tagged DLNA, Miracast, Windows 10. Bookmark the permalink.